Every bike shop- home or in the store, needs a great, all purpose hammer. 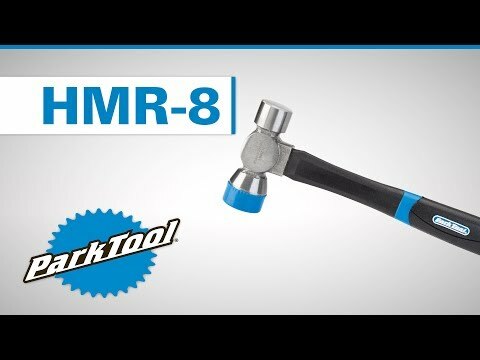 Park has worked through a few models, and the HMR-8 Shop Hammer has been designed with considerable feedback from bike mechanics, with a clear picture of current and future hammer use in the shop environment. The HMR-8 is a perfectly balanced striking instrument built for a wide variety of shop uses, and for the long haul, even with daily use. At 12" in length, the HMR-8 is 1.5" shorter than the HMR-4, which makes it more versatile and agile for use in closed quarters, without sacrificing much leverage or striking force. It features two striking faces, a 1" round forged steel, precision machined face for hard impact, and a 1.25" non-marring composite plastic striking face for less powerful blows. The tip is also replaceable, as it will wear with use. The head system weighs 8 ounces, which is perfect for the type of blows use in bike work, which are quite gentle in the scheme of the hammer world. The steel head is bonded to a fiberglass central handle that is incredibly durable and keeps the overall weight more balanced. The fiberglass has soft touch, tacky grip surface which is somewhat resistant to grease and oil, so you don't need to worry about the hammer slipping in your hand. We really like the HMR-8, as the HMR-4 seemed a bit much for most shop use, and we suspect you will prefer it as well.